Follow San Francisco Fog RFC on Facebook for our latest events and updates from the team. 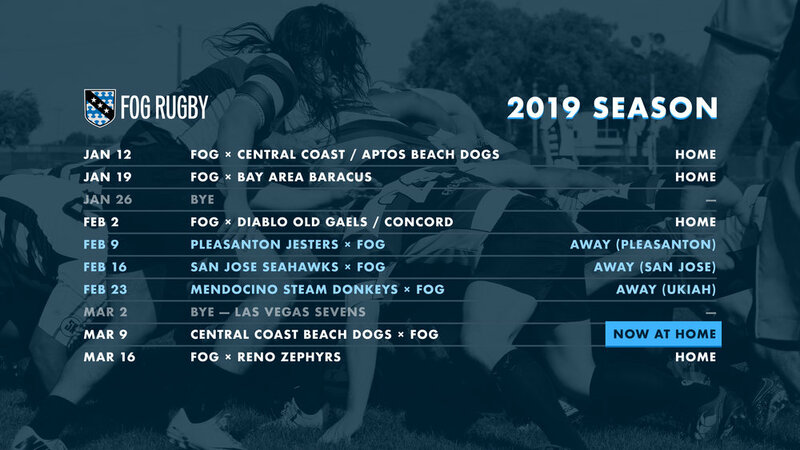 Our 2019 NCRFU season runs from January through March, come on out to a match! Buy Fog Rugby gear, t-shirts, jerseys and fan wear and support the team! The San Francisco Fog Rugby Football Club is the first gay and inclusive rugby club on the West Coast. Founded in 2000, the Fog has the vision to be the preeminent rugby club in the world that actively pursues the participation of people of color, gay men, and other groups traditionally under-represented in rugby. We believe everyone should have the chance to experience the camaraderie and brotherhood inherent to the sport of rugby. Players of any skill level are welcome to join, including those that have never played rugby or even an organized sport. The club is also involved in the local community both socially and philanthropically and we welcome everyone to participate — even if you don't want to play, we're happy to have you join the Fog Family. Learn more about the team, our history, and get in touch with our Board of Directors. We're happy to answer any questions you might have. Use this form to get in touch and we'll get back to you as soon as possible. Interested in joining the Fog? Come on out to a practice or send an email to join@fogrugby.com to learn more. Looking to donate to the team, buy merchandise, or become a team sponsor? Learn how you can support the team. Need to get in touch with a member of our Board of Directors, or interested in our history? Learn more about the Fog.